The book of the prophet Isaiah contains four obscure poems called the Songs of the Suffering Servant. They may be autobiographical, they may refer to the people as a whole. They introduce new ways to understand suffering and the mysterious plans of God. Jesus clearly meditated on these poems, and the gospel writers used them to express their experience of Jesus in the lives of their communities. Jewish converts to Christ, rejected by mainline Judaism, missed some familiar institutions they left behind. The Letter to the Hebrews persuades them that Jesus replaces everything they've lost. This passage explains why Jesus is a superior priest, compared to the priests of Judaism. The Historical Situation: In the middle section of the book of the prophet Isaiah, chapters 40-55, there are four short passages which scholars have called the Songs of the Suffering Servant. They're about a mysterious figure, who sometimes speaks in the first person, and whom God sometimes addresses. Sometimes the Servant is described as a prophet, sometimes as one whose suffering brings about a benefit for the people. In the original author's mind, the servant was probably a figure for the people of Israel, or for a faithful remnant within the people. Jesus saw aspects of his own life and mission foreshadowed in the Servant Songs, and the church refers to them in this time of solemn meditation on the climax of Jesus' life. Our Liturgical Setting: Today's is the fourth Servant Song. On Passion Sunday, we proclaimed the third, Isaiah 50:4-7. The others are Isaiah 42:1-9 and Isaiah 49:1-6. In the first few verses, God is the speaker. Then the speaker changes with, "Who would believe what we have heard?" This speaker is the prophet, musing on behalf of the whole people. The voice becomes God's again at "Because of his affliction, he shall see the light ..." This utterance of God seems to confirm the speculations of the prophet. As lector, represent these changes by pausing at each one and by changing your tone of voice. A Theological Reflection: Scholar John J. Collins, in The Collegville Bible Commentary -- Old Testament (Collegeville, Minnesota: The Liturgical Press, 1992) says the significance of the passage is how it "allows that suffering can have a positive purpose. As such it broke with a long biblical tradition that regarded suffering as a punishment for sin. It laid the foundation for one of the basic ideas of Christianity." Proclaiming It, continued: So the contrasts between him who suffered and us whose sins deserved the punishment, are what is important in your proclamation. Use your tone of voice to make those contrasts clear. The Historical Situation: Some of the first Jews to become Christians were quite nostalgic for the sacrifices that had been part of their earlier religion, but were absent from Christianity. Likewise the priesthood. The author of Hebrews works to reassure them that Jesus replaces those institutions in a superior way. Proclaiming It: This passage emphasizes that Jesus our priest experienced all the suffering that we do. In proclaiming the prior passage, I suggested you contrast us and the servant. In this passage, try to identify us with the Servant. 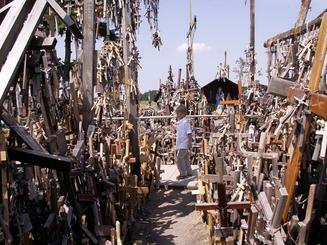 The Hill of Crosses, a pilgrimage site near Šiauliai, in northern Lithuania. Shortened history: Lithuania has long been a defiant pawn in eastern European politics. During one revolution, families mourning lost rebels placed crosses on the site of a former fort. The practice grew, becoming an expression of patriotism, peaceful resistance, and devotion to the people's Catholic heritage. Imperial governments tried to remove the crosses, most recently the Soviet Union in 1963 and 1973. But the people always put them back. Observers estimate the number of crosses in place now at over 100,000. Striking sunrise image by Kestas Balciunas of London.